Home Tags Posts tagged with "offensive"
Gaza and Israel have both suffered their deadliest day since the beginning of the current offensive. Israel says that 13 of its soldiers died since Saturday night, the biggest one-day loss for its army in years. 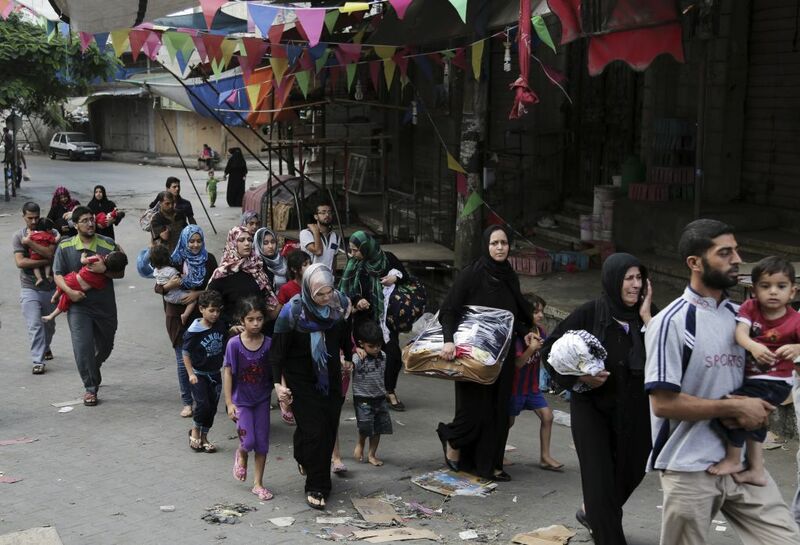 At least 87 Gazans were reported killed on Sunday – 60 of them in the district of Shejaiya alone. The total death toll in Gaza now stands at more than 425. Hamas said on Sunday evening that it had captured an Israeli soldier, but this has not been confirmed by Israel. Celebratory gunfire and shouts could be heard in Gaza City after the claim was made. Sunday’s death toll for the Israel Defense Forces (IDF) is higher than that sustained by the IDF during the entire three-week duration of Operation Cast Lead in 2008-2009, the last time that Israel sent ground troops into Gaza. It brings the number of Israeli soldiers killed in the current offensive to 18. Israeli PM Benjamin Netanyahu vowed to continue operations in Gaza “as much as we need to” despite the casualties. He said the Israeli government felt “deep pain” over deaths of its soldiers, and that Hamas, not Israel was responsible for the escalation in Gaza. Palestinian President Mahmoud Abbas said the deaths in the Shejaiya district east of Gaza City were a “massacre”. The UN says 83,695 people have now been displaced in Gaza and have taken refuge in 61 shelters and that the figure is “rising all the time”. Witnesses spoke of bodies lying in the street. A humanitarian truce was agreed in the area, but lasted less than an hour with both sides blaming each other for violating the truce. Paramedics said that rescue workers had not been able to get to the eastern part of Shejaiya, an area very close to the Israeli border and about 1.2 miles away from Gaza City, which has seen heavy shelling. Benjamin Netanyahu said Israeli troops had no choice but to enter densely populated areas and that they had asked civilians to leave. The death toll in Gaza rose sharply over the weekend, with the number of Palestinians killed now standing at more than 425 since the operation began, according to Palestinian health officials. They say the number of wounded from the operation now stands at more than 3,000. The majority of those killed are civilians, the UN says. The Israel Defense Forces (IDF) sent ground troops into Gaza on Thursday after days of heavy air and naval barrages failed to stop rocket fire from Gaza. Two Israeli civilians have died since the offensive began on 8 July. Israel says the operation is necessary to target Hamas tunnel networks, which it says it could not do from the air alone. Lt. Col. Peter Lerner, an IDF spokesman, said the offensive was being expanded “to restore security and stability to Israel’s residents and citizens”. Meanwhile, the UN warned it was running out of supplies to help more than 50,000 Palestinians who have sought shelter at its schools in Gaza. Qatar is expected to host a meeting between President Mahmoud Abbas and Ban Ki-moon on Sunday before the UN chief continues on to Kuwait, Egypt, Israel, the Palestinian Territories and Jordan. Mahmoud Abbas is also due to meet Hamas leader Khaled Meshaal. Hamas rejected an Egypt-brokered ceasefire last week, saying any deal with Israel must include an end to a blockade of Gaza.